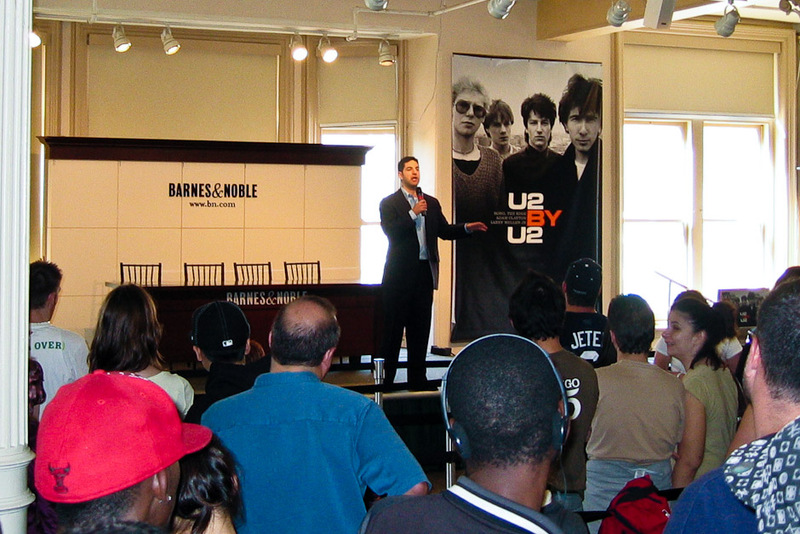 In late September, in support of their book, U2 by U2, U2 had three book signings, one each in Dublin, London, and New York City. 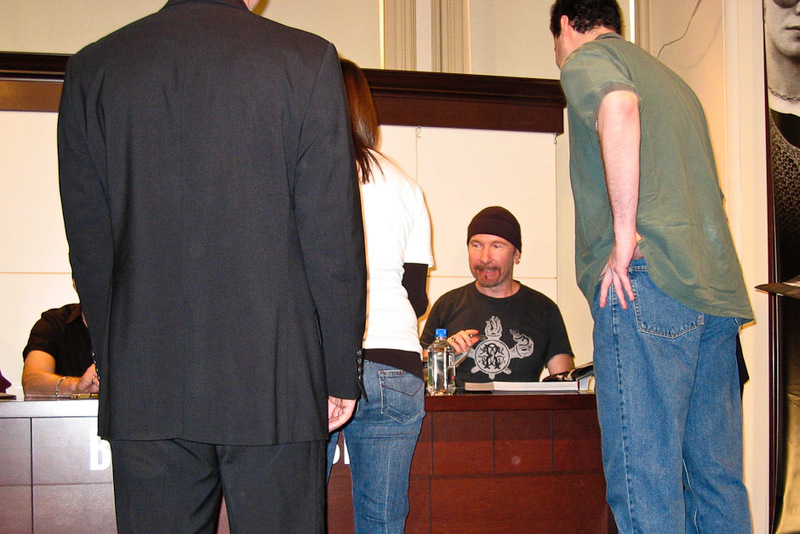 At each signing, 150 U2.com subscribers were invited via a lottery, and 100 others were allowed in via other means. I was one of the lucky ones in NYC. 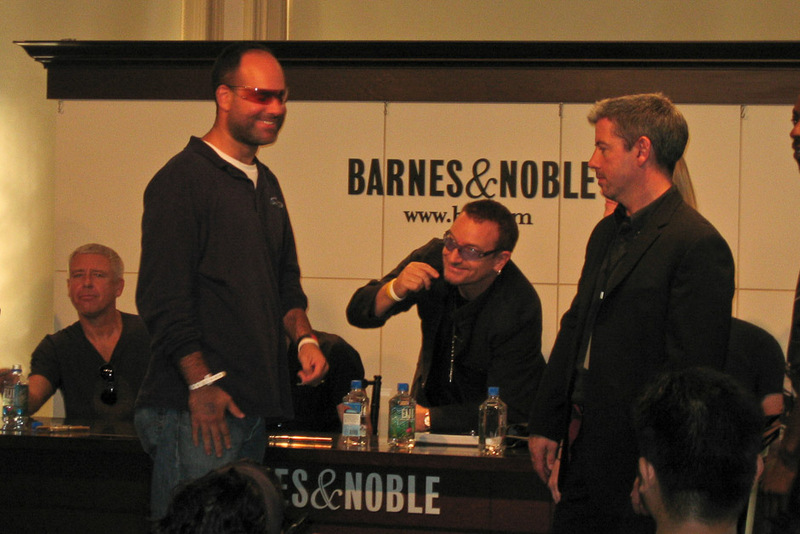 On September 22, 2006, I got an e-mail from U2.com stating that U2 will be signing their new book, U2 by U2, on Tuesday, September 26 in New York City. It said that U2.com had 150 invitations to the signing, exclusively for US subscribers. It further said that if I clicked on the provided link by 8 p.m. that night, I could enter for a chance to win one of the invitations, and that the winners would be notified on Monday the 25th. I clicked the link, entered my name and e-mail address, and went about my business for the rest of the day and the weekend. It also said that I would get an additional e-mail later in the day with instructions on how to attend the signing. I went back into the bathroom, finished my morning routine, went to work, and informed my boss that I probably needed to take Tuesday the 26 off. At 1:16 p.m., I received the second, promised, e-mail from U2.com detailing where the signing would be, and what I needed to do to get access. At that point, I told my boss I would definitely need Tuesday off. I didn’t tell him why, even though he insisted that he would need to know before approving it. I told him that it wasn’t a bad thing, not an interview or a court date, and that I would tell him why I needed the day off at a later date. I guess I didn’t tell him because I didn’t want to jinx it. On Tuesday, September 26, I woke up at 7 a.m., had my two cups of coffee, showered, got dressed, and headed downtown. The second e-mail said that I needed to pick up my wristband at the W Union Square hotel and that the book signing would be a few blocks away. I thought about what was in the Union Square area and immediately thought of the Barnes & Noble there. When I got out of the Union Square subway station, I could see Barnes & Noble, and the line of people that were lined up there. It went about half a block and around the corner before I lost sight of it. I got to the W at about 9:15 a.m., and walked in right behind someone else who was asking the staff how to get to the room for U2.com. We went up to the room, gave our names, got our wristbands, got a sheet of paper with the rules and location for the event (Barnes & Noble in Union Square - surprise), and headed back downstairs. Getting downstairs was actually a lot harder than you’d think. I hit the down elevator button, and an elevator came within 15 seconds. We got in and I hit “L”, thinking it meant “Lobby”. After a few seconds of elevator shaking, the door opened, and it didn’t look like the lobby. First off, it opened on the wrong side of the elevator (it’s the kind with two doors on opposite sides of the car), secondly, it opened up to a dimly lit hallway with ladders and stuff in it. We commented that that did not look like the lobby we came in to, and that the door opened on the wrong side of the car. We got back in, and hit “M”. The door opened to a nicer looking place, a bar with tablecloths. We got out and started looking around for the big staircase we saw in the lobby. After wondering around for a moment or two, I noticed that next to the elevator we got off of was a sign that said, “Service Elevator”. Aha! I swear, the button I pressed on the other floor didn’t have a similar sign. We found another elevator call button that didn’t have that sign on it, got in the next elevator, and went to the correct lobby. At that moment, I hoped that that was not a sign of things to come. When we left the W around 9:30 a.m., I could see that the line for B&N was gone, but there were still about 40 people outside the store. My hotel friends (sounds dirtier than it was) and I went to the door and asked security if we had to wait on the line since we had our wristbands. He said we can go right in and that the signing would be on the fourth floor. We went in, bought a copy of the book (receipt has the time of 9:34 a.m.), and then headed up to the fourth floor. Once on the fourth floor, access to anywhere was controlled via cordons and security personal. First I had to show my wristband, my receipt for the book, security had to search my bag, then I was issued a green index card with a number written on the back and a time stamp on the front. I was number 126. I was then told to get on line. The line was in the shape of a square with the cordons snaking back and fourth about nine times within that square. We started out on the right side of the square about seven rows back. We started out standing and said hello to the few people that were in front of us. The question of, “can we get out of line to go to the bathroom or get something to eat?” was asked and answered in the affirmative, by some people that had already done so. After a few minutes, the book started getting heavy, so down it went. It was about 9:50 a.m., and the signing wasn’t supposed to start until 1 p.m. The line ahead of us. "Sunglasses man" and "the pregnant chick" visible to his left. There were many different types of people on line representing all different colors, races, creeds, ages, financial situations, and I assume sexual persuasions (but we didn’t get that personal). You could pretty much tell the lottery winners from the people that camped out overnight. Lottery winners were alone, didn’t have a lot of bags, and talking to others around them in a very “nice to meet you”, non-familiar, sort of way. Campers were groups of people that knew each other, had chairs, bags, and were lounging around (they had been up all night, after all). One guy, who was almost definitely a camper, was laid out on the ground in a fetal position trying to nap. Another guy was the only one that was wearing “Bono style” sunglasses. One woman, who was very pregnant, was sitting on a chair that was obviously provided by the store, with, what I assume was her boyfriend/husband/partner/S.O. We nicknamed her “the pregnant chick” (for obvious reasons), and hoped that her water didn’t break while she was up on stage, although that would be somewhat memorable. We also wondered if her unborn child qualified as the youngest U2 fan there, and we concluded that it did not since it was not there voluntarily. We were sure that it would be a U2 fan at some point, though. You could also tell the obvious “ebayers” from the fans. “Ebayers” are people that go to signings expressly for the purpose of auctioning off the item to the highest bidder on eBay. There were a group of about seven “urban youths” decked out in Sean Jean, Gucci style Yankees hats, and other assorted “bling” that you could just tell were “ebayers”. They weren’t obnoxious, but they were annoying, especially as the signing time got near. The general discussion of when we first saw U2 in concert, the reaction we had to finding out we won the lottery, favorite albums, favorite songs, favorite lyrics, etc., went on for a little while. So did discussing how far we each came, how we got there, where we were staying, whether we were going back home tonight, and what we ditched to be there, went on as well. The woman I met at the hotel came from Syracuse, drove five hours the night before and was staying with family in Connecticut, but was going to drive back that night. Ugh. One was from Cleveland and flew in the night before, another was from St. Louis, and there were others from Chicago, L.A., Pennsylvania, and Hawaii. It seemed like I was the only one from NYC in our little group. I felt kind of bad saying that I got a normal night’s sleep in my own bed, got up at 7:00am, had my normal two cups of coffee, breakfast, and had a ten minute walk and six stops on the subway to get there. A few times, someone from the staff would make an announcement that we needed to compress the line a bit. They especially didn’t want people with folding chairs taking up a lot of space. It was okay if you were sitting on the ground, but laying down was frowned upon. As soon as this announcement was made, most people complied. When a store employee saw “the pregnant chick” get out of her chair, she ran over to the woman and, I assume, informed her that that announcement did not apply to her, and that she was welcome to sit, stand, lay down, or whatever she felt most comfortable doing, because “the pregnant chick” sat back down with a somewhat relieved look on her face. With the compression of the line, we wound up on the left side of the box, right up against the side cordon. Somewhere around 10:30 a.m. we noticed that B&N staff were pulling down a section of books on the Civil War and World War I. After the shelves were clear, they started stacking U2 by U2 books. Apparently, it was harder than it sounds because it took at least 45 minutes, six people, and four tries to get it right. They also put up a large photograph of the cover of the book. At the same time, a few other people started putting up a small rectangular enclosure that had drapes over it, and were setting up fruit on a table inside of it. 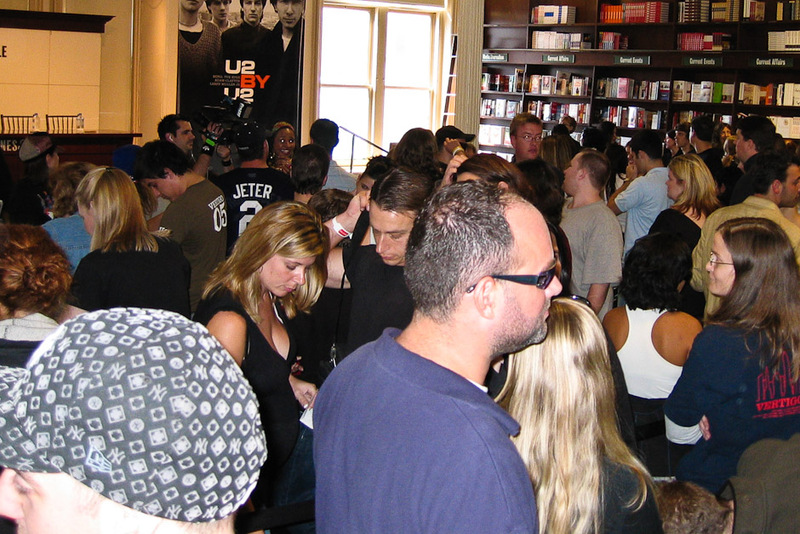 We put our heads together and came up with the theory that U2 would be posing for the press in front of the book shelves, then head into the little “tent” for a snack before heading onto the stage for the signing. That meant that they would pose for the press a few feet away from us. Cool. At about 11 a.m., some guy in a suit jacket got on the PA and made an announcement that included how the signing was going to work…once U2 was on the stage, each person would have to give the staff their bags and belongings and could only bring the one book that was to be signed on the stage with them. If a person had a camera, the staff person holding their bag(s) would take pictures of them on stage with the band, but U2 would not be able to pose, nor would a person be able to stand behind the band for their photo, lay across the desk, etc. After the book was signed, each person would have to leave the stage, get their belongings, get their wristband cut off, and head downstairs to the third floor. 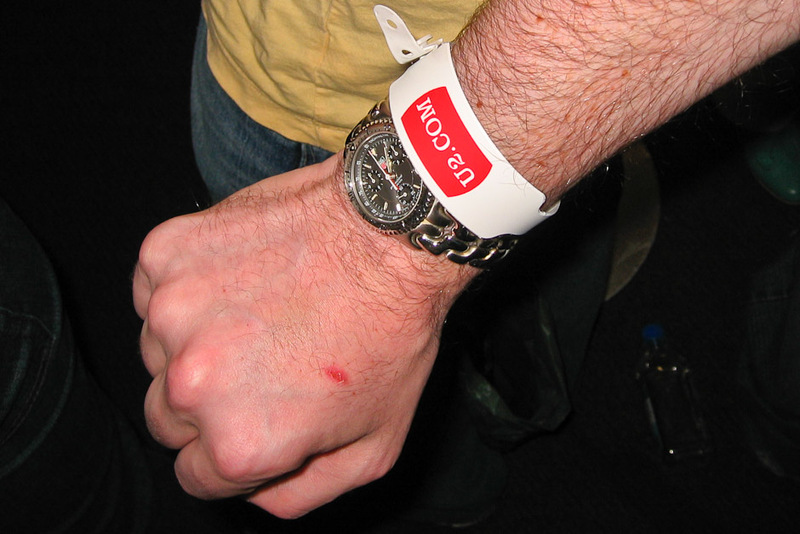 There were a lot of groans when we were told we wouldn’t be able to keep our wristbands and had to leave immediately, but there were no riots. After all, we were pretty happy that someone would try and take our photo when we were on stage with the band. After the announcement ended, we all went back to our conversations for the next little while. At around 12:30 p.m., the press started showing up and took stations right near us, as we expected. What we didn’t realize was that they would all have little stools and would completely block our view of the area. Oh well. At 1:00 p.m., the anticipation in the room was palpable. Just about everyone was standing up and had turned to face the back of the room, where we expected U2 to arrive from. It was then that my height paid off. Off in the distance, at the opposite end of the floor (which is a full block away), I saw a very bright light and a boom microphone floating above the light. Someone had a camera and was interviewing someone else. But who? I was up on my tippy toes trying to see who it was through stacks of books, pillars, and other people. We just wanted confirmation that U2 was on the floor and that the standing around would end sometime soon. “I see a head. It’s got short hair…and I think glasses…yes, definitely glasses…looks like sunglasses…reddish color. I think it’s Bono.” I gave a stream-of-consciousness report to those around me. Someone confirmed that he was wearing rose colored sunglasses at the previous night’s Superdome pre-game show, and that he cut his hair short.”Then it’s him,” I announced. That interview lasted about 5 more minutes. I announced that the camera light had gone off and the boom mic was lowered. We all got ready for the entrance, but then I saw that another camera light had gone on. “He’s doing another interview,” I told everyone around. That one lasted about 10 minutes. When that camera light went out, I saw Bono and a bunch of people disappear behind a bookshelf. I kept my eyes on that bookshelf looking for any activity. About a minute later, I saw a bunch of people in suits, security personnel, appear from behind that bookshelf, and walk towards our area. The press’s cameras were flashing, people farther back on the floor were shouting, “Bono! Bono!”, and everyone in our line were holding their cameras over their heads trying to get a photo, but the photographers were blocking the view completely. Even standing on my tippy toes, with my hands as high as possible, I was only able to get a shot of a head or two between the photographers. That’s okay, I would hopefully be able to get some better shots of them on the stage during the signing and we got closer to the stage. They stood in front of the photographers for a few minutes, then disappeared into that little tent area. Immediately, all the press that was near us, ran up to the roped off area in front of the stage, and set up shop there. Since they were on stools again, we had no view of the stage at all. It was about this time that a chant of “No more press!” started. About five minutes later, U2 took the stage. It took about five minutes for them to get settled. Not sure why it took so long, but I figure they were posing for the press, again. 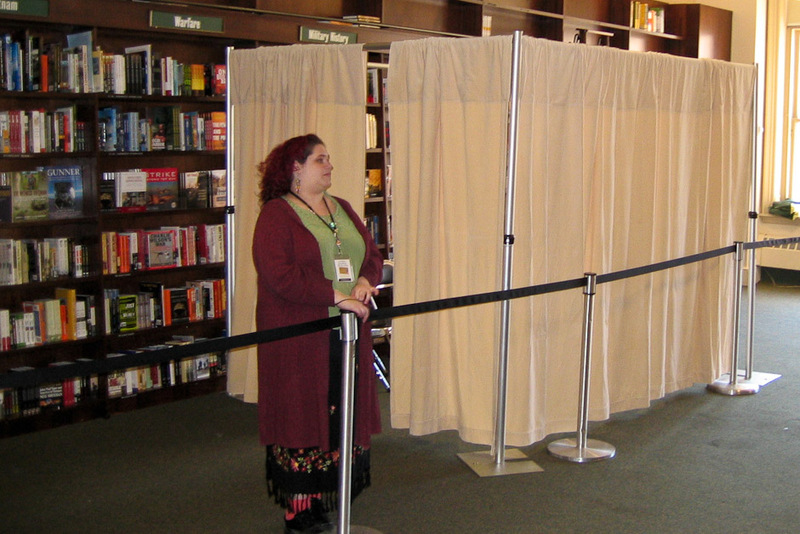 To the right of the stage, there was a line of people with books open to the signing page. The first one went up, and was off the stage in about 30 seconds. I couldn’t see what was happening on the stage because the press was still up there. After about the first 10 or so people went through the signing, the press disbanded, and we were able to see the full interaction with the band at the signing. It looked like you handed your book to the guy in the suit that made all the announcements. He made sure the book was open to the correct page for signing, put it down on the table in front of The Edge, and told you when to approach. It looked like The Edge would shake your hand, ask you your name, write something, answer a question or two, and then your book and you were passed on to Bono, who would shake your hand, write something, answer a question or two, and pass you on to Larry Mullen Jr., who would do the same, and then pass you on to Adam Clayton, who would do the same, and then your book went to a woman in some type of snakeskin jacket. She would hand you back your book and you would head off the stage. It seemed that women could request a kiss on the cheek from any member of the band, and none of them refused, but I can’t be 100% sure. I didn’t see any hugs. Bono and "sunglasses man" swapping sunglasses. 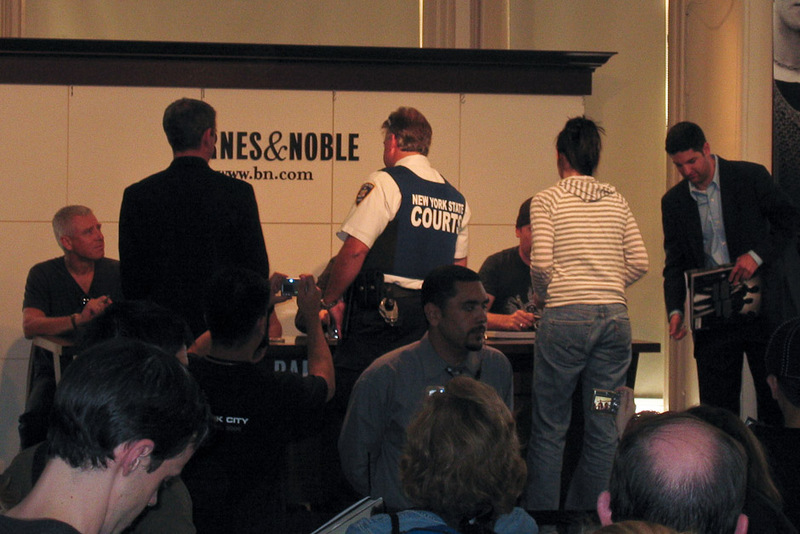 At one point, a New York State court officer went up to get his book signed, but it was a little strange because he was still wearing his bullet-proof vest. When “the pregnant chick” went up, Bono was all smiles, pointed to her stomach, said something, and she pointed to the guy she was with, almost with an “It’s his fault” gesture. They chatted for a few moments, and from what I could see, Bono was polite and charming, probably congratulating them, asking about the possible names, etc. “Sunglasses man” got to swap sunglasses with Bono for a picture, but had to swap back. A woman went up with her 8-10 year old son. Several of the police officers from the NYPD, that were on hand, got to get books signed as well. From the start of the signing, to when I got up on stage, was about 30 minutes. As expected, they took my bag and camera from me, checked the receipt for my book, my green index card (which they took), and let me climb a few steps to the guy in the suit. He took my book, made sure the dust cover flap was holding the first few pages open, put the book on the desk in front of The Edge, and told me to stand in front of the table. The Edge held out his hand, which I shook in a manly fashion, and he said, “Nice to meet you. Who should I inscribe this too?”, in a fairly quiet voice. “Joshua, like the tree,” with a slight smile, was my response. Let me be honest here…I tried to say it with a slight smile, but in reality, I was probably beaming uncontrollably. After all, I was meeting the band that I had been a fan of for almost 20 years, and while I have never camped out for any band over night, if I were to do it, it would only be for U2. 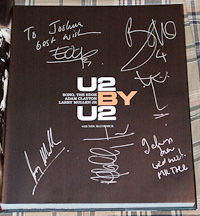 I watched as The Edge wrote out my name, he spelled it right, which I would have hoped, and he passed it off to Bono. Bono held out his hand, looked me in the eye, and said, “Nice to meet you. Thanks for coming,” as I shook it. I think I said something about being a big fan since The Joshua Tree, but I’m really not sure. I watched as he signed his name, drew a little drawing, and scribbled something down in the corner of the page. He then slid it over to Larry who was giving the woman in front of me a kiss on her cheek. Letting Larry know that not getting a kiss would "not be a problem". Larry, shook my hand and said, “Nice to meet you.” I responded by saying, “Nice to meet you too.” He then said, “I’m not giving you a kiss,” to which I replied, “Not a problem.” I’m sure I said something else, but I don’t really remember. It was starting to blur. The book was slid to Adam. He shook my hand, said, “Nice to meet you,” and signed my book. It was then slid over to the woman in the snakeskin jacket. She told me to let the signatures dry and to head off the stage. As soon as I left the stage, the woman that was holding my bag was there and handed it to me along with my camera.I was then pointed by security to head towards the escalator. As I approached, a woman was there with scissors and a garbage can. She cut my wristband off, but gave me the part that had the U2.com logo on it, then told me to head downstairs. After hitting the third floor, I saw a few of the people that were in our little group standing with their books on a table display. I plopped mine down, and we traded stage stories as well as compared signatures. 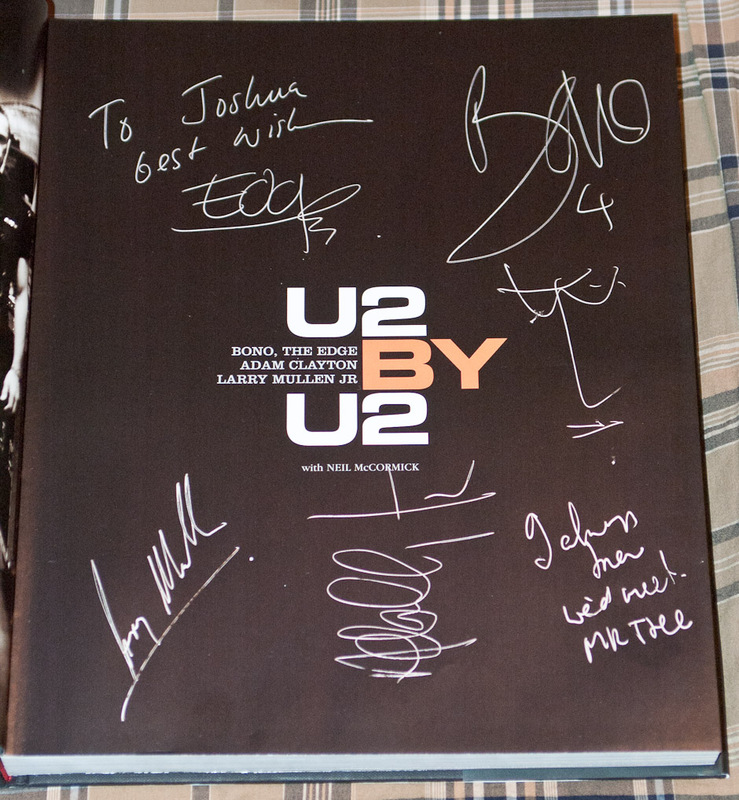 I noticed that Bono drew what looked like the profile of a face in the guy’s books, and a flower in the girl’s. 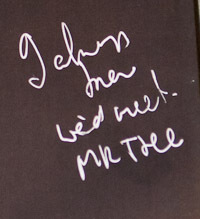 It was during the comparison that I noticed that Bono wrote something extra on the bottom of the page in my book that the others didn’t seem to have. The only problem was, none of us could tell what it said. 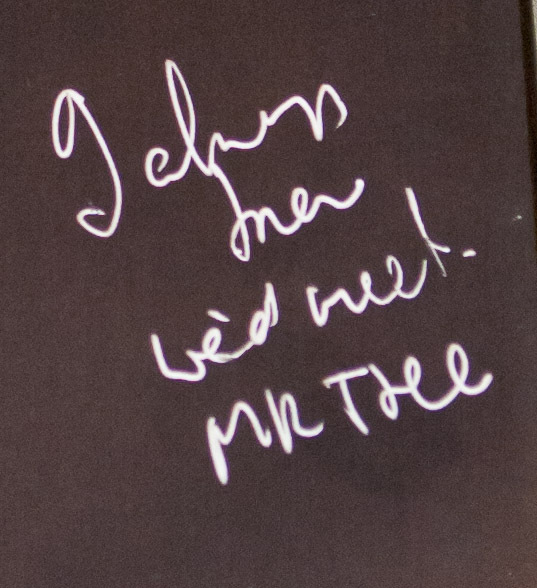 Here I am, with a personalized message from Bono, and I can’t decipher his handwriting. Great googly moogly! The women all swooned about how cute Bono or Larry was (or both), how they got a kiss and weren’t going to wash their hands/cheeks for days, and how one of them might even hug the book a little in bed (she was joking — I think). After trading our experiences on stage, and testing to make sure the ink had dried, we closed our books, headed out of the store, and went our separate ways. There’s a great line from the movie Fight Club about “single serving friends” which I was reminded of. After getting home, I tried to decipher the message again. I think I managed to figure out a few of the words, but they didn’t make sense together. Then I had a brilliant idea…I took a high resolution photo of the note and posted it on the U2.com message board. Somewhere, someone should be able to figure it out. Within 30 minutes, someone did. As soon as I read the reply, it was obvious what it said, and I wondered how I didn’t figure it out on my own? Mr Tree? Is that because I’m freakishly tall? Do my arms look like branches? Oh…I get it…it’s a reference to the comment I made when The Edge asked who he should inscribe it to…“Joshua, like the tree”. Cool. Based on the time stamp of the photos that the woman took of me while I was on stage, I was up there for 51 seconds. I’m trying to think of a better 51 seconds that I’ve had in my life, and maybe my first time qualifies, but like meeting U2, it was all a blur. Let me sum it up like this…I’m 33 years old, and for a few hours that day, I felt like a little kid on Christmas morning, and my father had just pointed out the Red Ryder BB Gun in the corner. I haven’t felt like that since…well..a Christmas morning, many, many years ago. The refreshment "tent" near the stage. The youngest fan, and his mother, with the band. New York State court officer getting his book signed. Press. I swear that guy in the green shirt and black hat was in line at the Apple Store opening.